Backed by our huge experience in this domain, we are engaged in manufacturing and supplying quality accredited Gym Exercise Cycle to its clients. This cycle is fabricated through high-grade components that are in tandem with national and international standards. 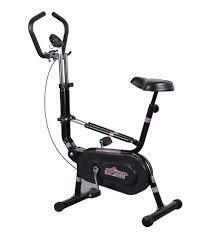 It provides smooth and quiet full body cardiovascular workout. This cycle is equipped with electronic meter display for distance, time, calorie burned, and speeds. Apart from this, Gym Exercise Cycle is available at very exciting prices keeping in mind budget of customers for their convenience. Also, it is a complete blend of excellent durability and strength that sets it apart from other similar products.